A Russian Soyuz rocket carrying the Progress 69 cargo ship stands atop its launchpad at the Baikonur Cosmodrome in Kazakhstan. The launch of a Russian cargo ship bound for the International Space Station was aborted in the final minute Sunday (Feb. 11), just as it was poised to fly the fastest resupply mission to the orbiting lab in history. The uncrewed Progress 69 resupply ship and its Russian-built Soyuz 2.1a rocket were just seconds away from launching into space from Baikonur Cosmodrome in Kazakhstan when the abort occurred. The spacecraft, known as Progress MS-08 in Russia, is carrying 3 tons of food, fuel and other supplies for the station's six-person Expedition 54 crew and was scheduled to make a superfast 3.5-hour trip to the orbiting lab after liftoff. "The launch of the Progress 69 cargo craft to the International Space Station has been scrubbed," NASA spokesman Rob Navias said during live launch commentary. "The countdown ended just seconds before liftoff with an abort command that was sent from the blockhouse at Baikonur." 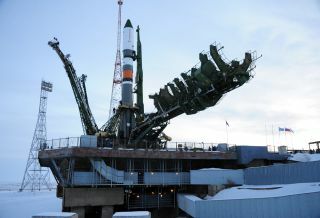 In the final minute before liftoff, two umbilical towers are designed to pull away from the Soyuz rocket at key stages in the launch sequence, Navias said. One of those towers retracted as planned about 35 seconds before liftoff, but the second umbilical retraction at the 12-second mark did not, he added. That second umbilical retraction is typically followed by the start of launch sequencing and engine start sequencing processes, Navias said. Launch aborts are rare for Russia's Soyuz rockets, the country's workhorse boosters for crewed and uncrewed space missions. However, Sunday's launch abort shares similarities with the last-minute abort of an earlier cargo ship —Progress 68 —on Oct. 12. That mission also was originally scheduled to last just 3.5 hours. When it launched two days later, on Oct. 14, it flew a more traditional two-day rendezvous to the space station. Russia's Progress cargo ships are automated resupply spacecraft that can dock themselves at Russian berths on the International Space Stations. The spacecraft have kept the station stocked with supplies since the first crew took up residence in 2000. Progress vehicles (and Russia's crewed Soyuz capsules) used to take two days to reach the space station, but in 2013 Roscosmos began flying shorter 6-hour trips with the spacecraft, drastically cutting down their transit times. Those 6-hour trips send Progress vehicles on four orbits around Earth before they arrive at the station. Sunday's attempted launch would have sent Progress 69 on just two orbits of Earth before it arrived.